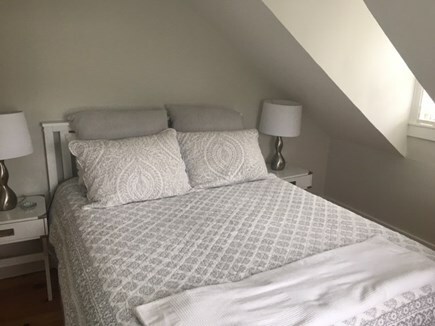 Location, Location, Location – New to the rental market, this fully renovated centrally located Cape checks all the boxes. 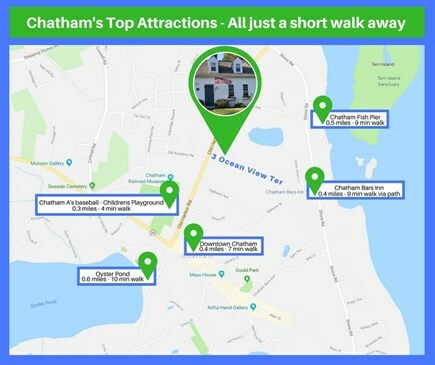 Within minutes you can walk to some of Chatham's top attractions including Downtown, Chatham Bars Inn, Oyster Pond, Chatham A's baseball games, and the Fish Pier. This well-appointed home features a new chef’s kitchen with a 20' vaulted ceiling open to sunroom/seating area. Sliding doors take guests from the sunroom to a patio with outdoor seating or you may enjoy your meal in a separate dining room just off the kitchen. Kitchen features stainless steel appliances, white cabinets, white quartz counter-tops and a large island with seating. 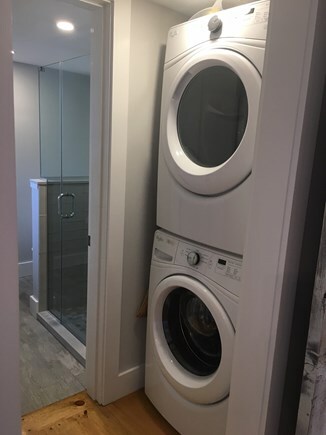 Also downstairs is a new laundry room and full bath. 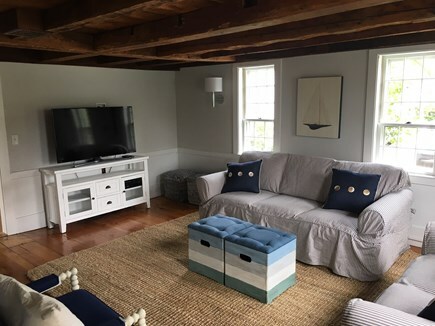 Rounding out the first floor is a comfortable living room, a perfect place to gather with family and friends and enjoy the Red Sox games on the new 55 inch flat screen TV. Upstairs is three bedrooms and one full bath. All have been repainted, and the wide pine floors have been restored to their original beauty. The bedrooms have new furniture and new bedding. 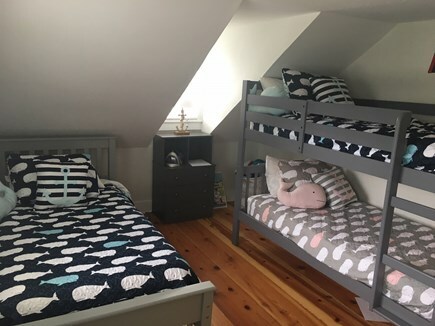 Two bedrooms with queen beds and the third bedroom, the “kid’s room”, features bunk beds and a twin bed. 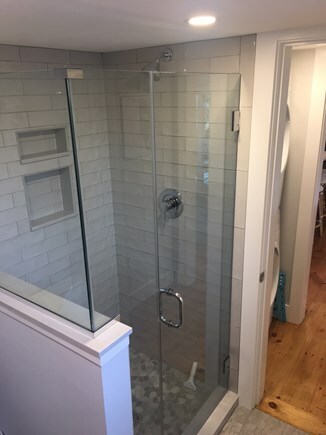 After a day at the beach, rinse off the sand in the new outdoor shower while your kids enjoy playing whiffle ball in the large, private side yard. Enjoy the comforts of your own home in this well-equipped Chatham rental. There is no need to pack up two cars to go on a family vacation anymore. 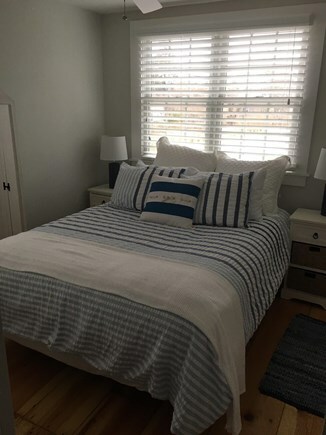 This inviting home is stocked with new linens, towels, beach towels, beach toys, stand up paddle board, back pack beach chairs, adult bikes, Double BOB Jogging Stroller, Radio Flyer red wagon, Graco Pack ‘n Play, high chair, board games and many other items to make you feel right at home. 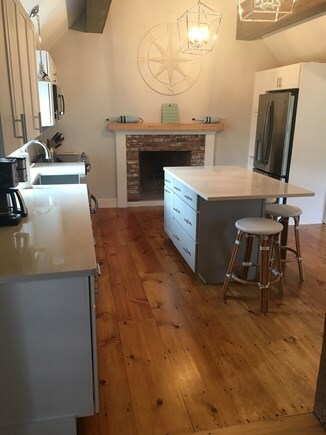 Whether you are a family looking to enjoy the sand and surf or a couple looking to explore all that Chatham has to offer, this newly renovated home is the perfect place for your next vacation. -New amenities include Central Air Conditioning in entire house, Outdoor Shower, Weber Gas Grill, Sonos, 55 inch Samsung Cable TV, and much more. Additional pricing info: Price does not include $190 cleaning fee. November Special - Book 4 Nights get a 5th night free, State and local taxes of 12.45% will apply. Great house, came as advertised. No complaints, owners were easy to deal with as well. This home was perfect for our family of 5! The interior of the home was new and very nicely decorated. It was fully stocked with everything we needed for our 2 week stay. The location was perfect. We could walk to town and to Oyster Pond. We biked everywhere as well. It was really central to everywhere we wanted to visit. The homeowner could not have been nicer and more knowledgeable about the area. We would definitely return!! 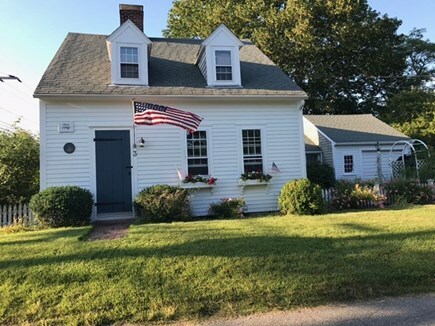 This lovely home in Chatham, MA was rented by us for the first time in July 2018. The main frame of the house is a historic preservation which we loved. 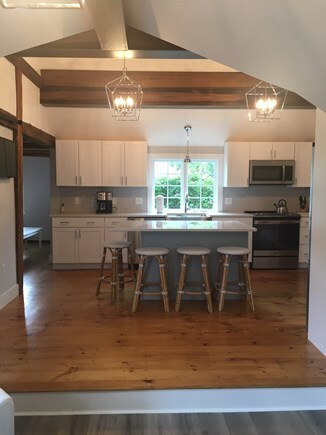 The addition/renovation was beautifully done, especially the kitchen and sitting area. Very crisp and clean. Beautifully stocked. Three bedrooms are small. We were three ladies renting. Two opted to use upstairs bathroom, one used downstairs bathroom. A slight inconvenience but good to know if you have gentlemen guests staying. Thanks for your review and feedback. I'm glad you ladies enjoyed the house and your stay. We will be down there the last week of August and we will be sure to add some mirrors and especially a full length one. 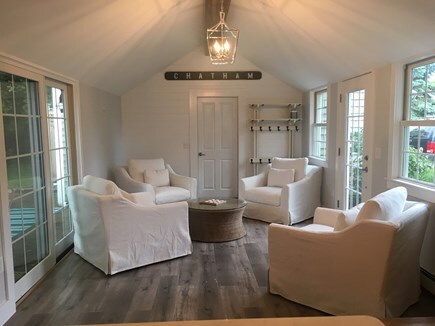 This house is so cute and clean, and has more room that it appears! 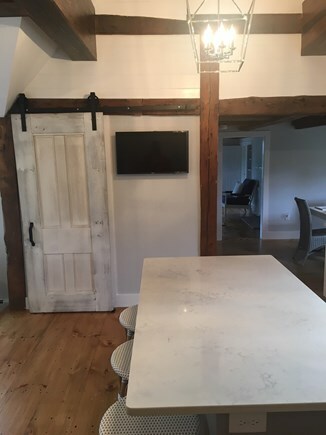 It has been newly renovated, keeping with the charm of the 300 year old home with incorporating the openness of a newer home. It offers the VRBO guest everything they need, including a well-stocked kitchen, washer/dryer, towels, and linens. All three bedrooms (with comfortable beds) and one bath are upstairs, the other bathroom is downstairs. We enjoyed sitting outside/sunroom most of our stay. The garage has a full array of bikes (kids and adult), wagon, and beach toys...and including an outdoor shower! We walked everywhere, because it is so conveniently located!! The owner was more than helpful. He went out of his way to make sure that we felt welcome, happy, and aware of everything that the home/town/area had to offer....there was even a welcome note and bottle of wine when we arrived!! If we return to the Cape, we will definitely return to this home! Thank you for sharing your home with us! The Cape was good, but the house helped make it great!! My family of five lives in a suburb south of Boston and we are excited to share with you our favorite family destination. We purchased this home last summer and ever since buying the house my daughter jokes that she wants to move to Chatham because there is ''so much more'' to do there. 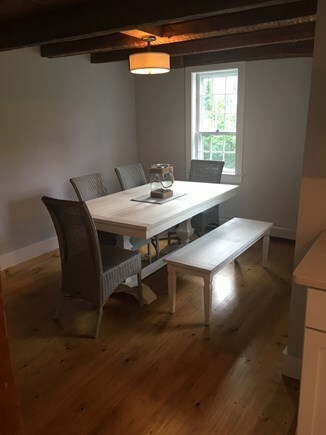 Immediately after the 2017 summer season we received approval from the Chatham Historical Society to conduct major renovations so we hired a great local builder who is transforming the home into a perfect summer retreat all while mainting some of the historical charm. The ''In Town'' location of our home is truly what makes for a memorable vacation or weekend getaway. 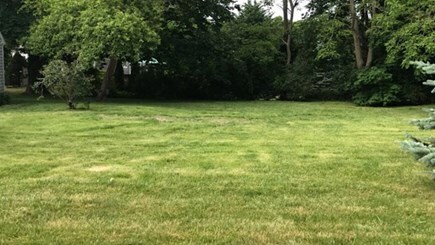 The ability to easily walk to all of Chatham's best attractions like shopping/restaurants downtown, Veterans Field, Chatham Fish Pier, Oyster Pond and the Chatham Bars Inn allows you to park your car for a weekend. For a family of five not having to use a car seat for the weekend makes it truly feel like a vacation. It's no surprise that Coastal Living Magazine listed Chatham as one of the top 20 places to live on the coast and described it as a ''charming town on the elbow of Cape Cod''. Chatham has a lively downtown with family-owned shops and restaurants, all within walking distance from our home.